« Where Does God Hang Out? Yesterday, I was privileged to visit the Walled Garden at Clumber Park, Sherwood Forest. At present a 19th century long greenhouse is being lovingly restored to its former glories. Yet, for me it already is reflecting a glory of sorts in its large collection of grapevines. After much pruning and tender attention for the last six months or so the white grapes now hang there for all to see in their bounteous manner. Ripe for the picking and awaiting their edible fate! So why write about it here. Well one of the Nazarene’s most famous sayings came to mind as I stared in wonder at the paradox placed before my eyes. In the past I sat around long enough in church circles to hear numerous talks on these words all taking the same theological tact, viz. using Yeshua’s words as proof texts for his Divinity. Yesterday though, it was different as I focused on the wizened wood on which the abundant fruit chose to hang. It got me thinking. Having passed through a PTSD period, where one’s psyche is stripped bare, I now look for the psycho-spiritual insights of the Nazarene’s teachings and this one is, I believe, a wee gem. Let me start by suggesting that the litle phrase, “I AM”, one frequently used by Yeshua, is a teaser of sorts. He is pointing to the Transcendent Source of All, the One who just is, depending on nothing else for Its existence. In applying this term in His sayings the Galilean is opening up to us the world of Spirit, the higher realm in which we were spawned to swim. He is trying to unveil the mysteries of how and why we tick. 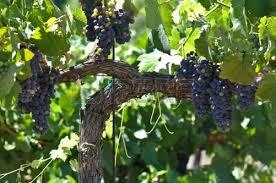 The Vine represents Source and all that It has birthed, the whole God filled shebang. We can only understand our being in the Light of the I Am transcendence. The Nazarene, may I suggest, isn’t pointing primarily to Himself but to the Cosmic Parent who holds together all in all. So where do we come in. We are the space-time channel of the Divine Life, the branches if you like. Like old wood we don’t look that special, even to ourselves but we contain within ourselves the Divine sap that will manifest Itself in Its fruit of choice. May I go even further and suggest that the old wood of the branches is none other our psyche-soul, that part of us that weathers the storms and wounds of life. In other places I have written of how the Nazarene is a transmitter, perhaps a unique one, of all that flows from Divine Love. In doing so He is, or becomes a microcosm of the Vine Itself. In asking us to remain in Him, the Nazarene is asking us to stay within the desire field that emanates from him, that Divine magnetic field that realigns our battered psyche-souls with the Divine Flow. We are mimetic creatures here in space-time. We were designed to absorb desire and follow its leading. The Nazarene is challenging us to remain within the Divine desire flux, to allow ourselves to be drawn into the very heart and mind of Divine Love, as He did. He isn’t a Model that will not reject us as we become like Him. Rather He will rejoice and bless Source for the familial extension of the Divine Image. He will remain in us as a magnetic Presence, one that leads us out of the captivity of ego and into the very I AMness of Source. The plans and purposes of Divine Love, the Source script of the Divine Drama, will come to pass, way beyond our widest imaginings, as we remain under the influence of the creative Spirit. Fruit will pop up without any religious or moral effort, without the strains and efforts of ego sponsorship. Divine Love can produce fruit with ease; all its asks is to remain, and to be open to Its inflow of Life. Of course the annual pruning will be the surgery of soul-work, when Love has a word with our restless sub-personalities, all hot and bothered in their doubts of Divine approval. Best to let the Spirit vine dresser do Its thing without fuss; the sooner our psyche-healing gets going the sooner we will feel the joys of connection with Life-bursting Source. If we try to step out of the Nazarene’s desire field, we will return to the manipulation of skewed desire and all its resulting inter-personal problems, viz. Model Obstacles and Monstrous Doubles. Even though we sweat blood in the mimetic realm of man we won’t produce anything of real worth, for all will pass and disappear into the mists of time. The fruit of Divine Purpose will remain, in some shape or form way beyond the mystery of death. Perhaps it will be served up in a special cup, as the Wine of our Journey, at the Wedding Feast of I AM and Its reunited Lover. I guess we’ll find out one day!